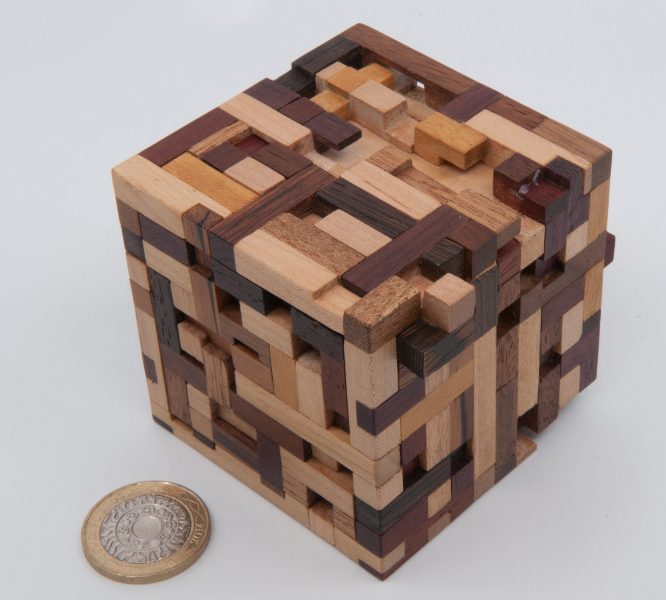 Covered in a wonderfully colourful patchwork of no less than 130 individual little pieces of exotic wood left over from the previous half-dozen Stickman creations, this little 3-inch cube is stand-out beautiful. 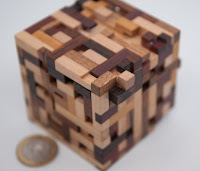 A cursory examination shows lots of little pieces criss-crossing the surface in a highly unpredictable fashion. They go over and under one another on each face and often chase one another around corners. Sometimes the relative interactions among pieces are clear to the eye, and sometimes they’re hidden under a layer or two – but effectively you have a large three-dimensional Tokyo Traffic Jam – with no obvious start or end state… some pieces will move at the start, but don’t seem to unlock any further moves, which is a little odd. 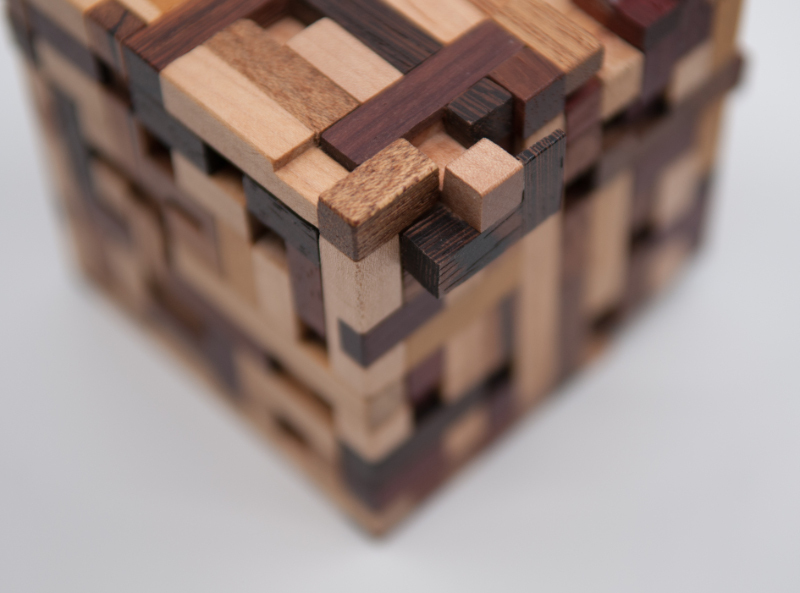 More often than not you’ll find yourself moving a piece and then trying to figure out what could possibly have now been released to allow the next move… and coming up blank. Start making serious progress through the thirty odd moves required and memorably a bit will come adrift – a little alarming the first time you see it… and less so subsequently. Somewhere along the way it turns from being a sliding block puzzle into a sequential discovery puzzle, but all the way through, it’s a very clever puzzle box. There is a wonderful moment during every solver’s journey where you spot something really interesting and your tools transmogrify into exactly the sort of thing you most need right at that moment, unlocking the door to your final discovery.